Singapore market Open low this morning following the weak closing of the US market, dow jones close 174 point lower last night, but during the day the straits time index index manage to recover more than 20 point losses and close flat at 2808. This was mainly due to the strong recovery of oil price trading in the Asian market, oil was up 3.5%. Blue chip oil stock are among the top gainers today. Next Thursday April 14. ,Monetary Authority of Singapore will announce its semi-annual monetary policy decision, the Monetary Statement will be release at 8am in the morning, MAS is expected to keep policy steady at next week's review, but a number of economists say a further easing this year remains a distinct possibility in the face of slow growth, low inflation and depressed global demand. Investor can look out for MAS policy to allow Sing dollar to be strengthen, if Sing dollar strengthen, this will benefits the bank stock. If MAS policy is to slowdown Sing dollar strengthen, then the news will be bad for Banks stock. 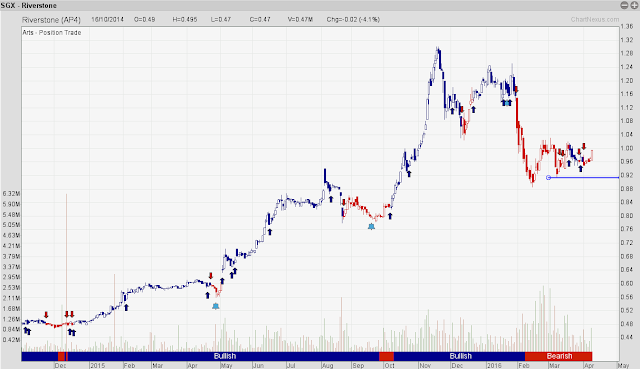 Singapore bluechip seems to be in a profit taking period after the rally in march. Right now, i am watching the Rubber glove sector. right now there is 2 stock listed in singapore, UG healthcare and Riverstone, over the past few both have fallen due to the Strengthening of Malaysia ringgit which affects all the Glove stock in singapore and malaysia. As Ringgit start weaken this few day, we see Glove stock might have chance to come back again. Riverstone - breaking out of consolidation?